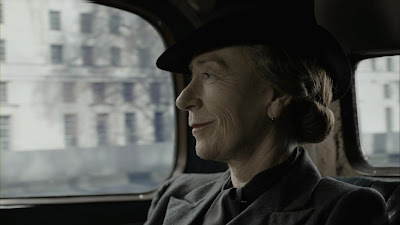 I have been waiting since March for new episodes of Foyle’s War. This is the amazing series that took place during World War II focusing on retired Detective Chief Superintendent Christopher Foyle. What was fun about the series was how it took place during war-time England but wasn’t always about the war or Nazis. It was about everyday people in the UK who still were criminals but maybe for different reasons. Maybe the war turned them into criminals to survive. The first 7 series took us from early years of the war and taking us to the end. As the war ended, it not only felt like a new life awaited the people who lived through the war but also to us, the viewers. I have been lucky enough to get my hands on the upcoming Acorn Media Blu Ray of this series and thought I would approach the review differently than usual. If you are a US fan of Foyle’s War you know that it will make its PBS debut on Masterpiece Mystery on Sunday September 15th. It also will be making its debut on the really wonderful streaming service Acorn TV on September 16th (www.acorn.tv) and the Blu Ray arrives to purchase on September 24th. I figured over the course of the next three weeks I would review a new episode of Foyle’s War each week prior to air and hopefully some people will find that interesting. There is one thing that is quite prevalent with the start of Series 8 of Foyle’s War and that it is truly a new world. World War II is over but that doesn’t make everything better. Things don’t instantly go back to how they were before and nothing will ever be the same again. There is an eye-opening moment when Sam and her new husband Adam are talking about the rationing that is still going on and she remarks how odd it is that they have to still ration after the war has ended but they won the war. As a civilization today, could we do that? The year is 1946 and the UK is war-torn especially in London. A way to take care of the displaced population whose homes were bombed out, pre-fab homes were built as way to keep people in housing. When we left Christopher Foyle at the end of Series 7, he was off to America. He made a bit of a fuss over there but as he gets off the boat back in the UK, there are people waiting for him. The group of men is led by Arthur Valentine who works alongside Hilda Pierce. 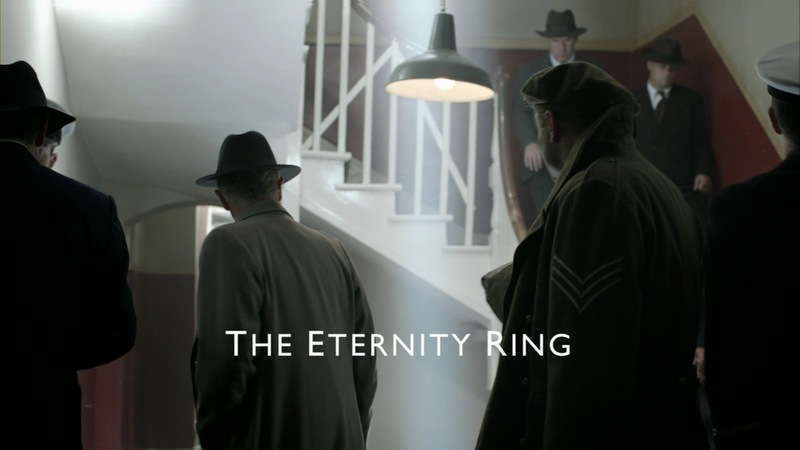 We have seen her before in the series and she has been forced to bring Foyle into MI5 to help investigate a suspected Soviet Spy ring called The Eternity Ring located in the heart of London. As mentioned above, things have changed a lot since Series 7 and we actually start this episode off with a bang, literally. We are privy to seeing Professor Fraser, his wife and a man named Max Hoffman in Jornado Del Muerto in New Mexico where we see the very first test of the atomic bomb in 1945. 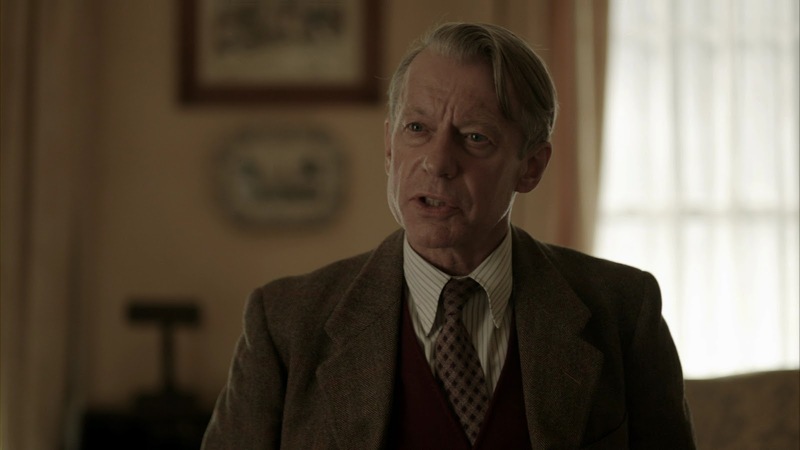 It’s a great effect and tells us that things are very different in the world of Foyle’s War. It’s these same people we catch up with a year later as Foyle needs to investigate Professor Fraser in regards to the Eternity Ring. He is extremely patriotic and hates Stalin which makes the investigation more difficult. Still, information is being leaked. Before Foyle is allowed to begin his investigation, he is shown a photo of an actual hand off of information between the Soviet spy Gorin and the person working for Professor Fraser. 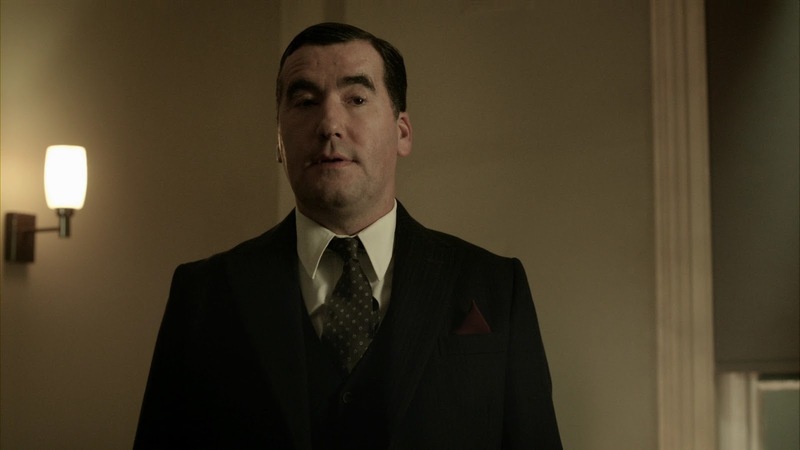 It is Sam, Foyle’s friend, who is believed to be a spy. I have been waiting for new episodes for a while and this did not disappoint. 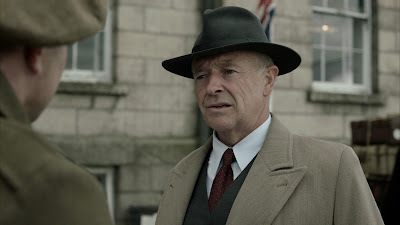 Written by the creator of the series, Anthony Horowitz, this is a great episode of the series that feels like Foyle’s War but takes us in a new direction. I think I am really going to like this new series. One reason is that I feel, at least so far, that it is more focused than Series 7. Series 7 was great and in fact that was where I started to watch the series, before going back and watching all of them, but the 3 main characters Foyle, Sam, and Milner were living different lives during the post-war and it was becoming a little tenuous for them to meet up or interact in episodes. I was also disappointed in what the character Milner became in Series 7. With what I have seen so far of Series 8, it is in some ways a re-boot without throwing out the baby with the bathwater. Milner is out as the focus of the series has now shifted. The series has moved onto to a new war for Foyle. The Cold War. This revelation is hit over our heads a lot during this episode. I call it the Goldeneye effect. Basically in that film we are told ad infinitum about how the Cold War was over and James Bond was an old relic from a bygone age about 70 times. This is the reverse; we are told that this is a new war that the Soviets have started. Maybe people spoke like about the Cold War like that back then, I obviously don’t know but it seems like much. What I did learn from this episode was that the term Cold War was coined by George Orwell in 1945 after the first Atomic bomb was dropped. Of course Foyle’s War always educates me in some way. I really liked this episode. It was hard to get used to some of the changes. We get new opening credits and a new take on the theme music. New credits are virtually the same as the old but updated to incorporate the Cold War. The new theme music is growing on me but I prefer the more traditional approach that we are familiar with on the old version. We have new characters to meet. I thought the direction of the episode overall was good. To me there was one big hiccup where something was made so obvious that it gave away its importance too early on in the story. It actually ruined the surprise for me and I felt it could have been done in a more subtle way. I would be interested to see if other people pick it up. Michael Kitchen returns as Christopher Foyle. This is what I have been waiting for since March. There is nothing better on TV than watching Christopher Foyle question the accused. Kitchen always underplays Foyle. When he gets mad it is never about raising his voice but one always knows what he’s thinking from the way he looks at people or the cadence of his speech. He is always a treat to watch. If there is ever a re-make of one of my favorite British TV series Quatermass, he would be an awesome Quatermass. As usual with most episodes there is a point that Foyle explains to the criminal (and us) what is going on. He explains what he knows about the situation and how he knows it. This is always a highlight to the episodes because Kitchen delivers these scenes so well. Honeysuckle Weeks returns as Sam Wainwright. She is married now to Adam. She met Adam at the beginning of Series 7 in The Russian House. They ended up working in a hotel that Adam owned that literally fell apart at the end of the series. Adam, who is now played by Daniel Weyman, is going into politics. He needs his wife to be by his side since perception is everything. It is a new life for both of them. Sam is the same girl she has always been so one wonders how she got messed up with spying for the Soviets…. Ellie Haddington returns as Hilda Pierce. She is a mysterious lady who always turns up in strange places that surround espionage. She is not quite the ally of Foyle’s as might be expected. It is always good to see her in these episodes. We first saw her way back in the episode War Games. Tim McMullan plays Arthur Valentine. He is the person that meets Foyle as he returned from the US. He has a secret that would have been a big deal in 1940s England. I love programs that recapture the look of the 1940s. It is done very well here. I looked online and I saw some people posted some goofs made in this episode in regards to historical detail and they called these goofs sloppy. I would disagree. There is a lot that goes into these episodes. As we get further away from the 1940s, the harder it is to recreate it. The series is filmed in Ireland and the attention to detail, the way I see it, is pretty awesome. I just sit and take in the sets, the roads, the atmosphere; everything that makes this series so special. I watched this from the Blu Ray set. I was first sent the DVD which looked nice but then I received the Blu Ray which is absolutely gorgeous. The attention to detail is phenomenal and I feel this is truly the correct way to watch this series. Foyle’s War Set 7 Blu Ray and DVD are available on September 24th. Both sets retail for $49.99. Don’t forget to give Acorn TV a try (www.acorn.tv). It’s a great streaming service for wonderful British television and extremely affordable. I started to use it when writing reviews for DVDTalk and still use it. For one low price, I have access to a great selection of television. Let me know if you have any questions about it. 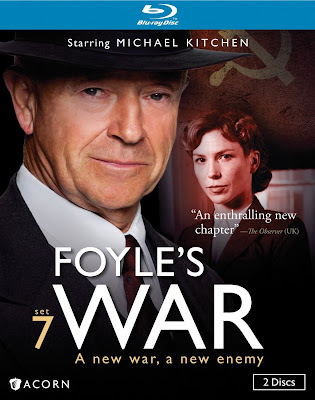 Apart from that, support Foyle’s War by watching this weekend on PBS! 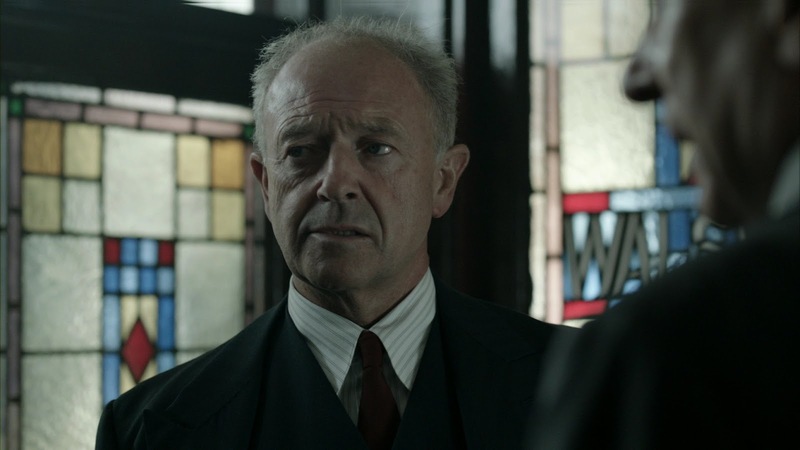 Next week: Foyles War Series 8 Episode 2 The Cage. I also will be publishing my review of Doctor Who: The Ice Warriors from BBC Home Entertainment with the two missing episodes animated. This series sounds exciting. I'm going to set my DVR to record. Out of curiousity Greg in an earlier article you mentioned the possibility if upconverting classic Who for Blu Ray, but you had naysayers saying it was not possible. 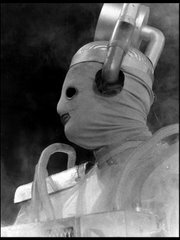 What is the differance between upcoverting Season 1-4 of the New Series to the Classic Series eps of Doctor Who? It's not that it is not possible but more people are wondering if there would be anything gained from doing it. The quality of the releases are pretty high yet the thought is that Blu Ray uses different compression methods which may slightly enhance the quality of the compression. If you take a look at the original release of The Green Death, and the new one you can see how much the compression has improved. The new series Blu Rays, to me, are a way to repackage a segment of the show that is still on the air. I am not so sure if they will be doing that with the classic series but who knows. There are more episodes they need to release now so Season sets on Blu Ray have suddenly become a lot more viable.